The risky Russian market is driving out many, but the investors ready to tough it out believe they’ll reap big benefits, as the downturn is cyclical. RT spoke with several participants at this year's Gaidar Forum, one of Russia's big economic conferences. “We will continue to invest heavily in this market despite the challenging times,” Mark Otty, manager of Ernst and Young’s Europe, Middle, East, India, and African operations told RT at the 6th Gaidar forum, being held in Moscow January 14-16. Despite Russia’s economic downturn and a weak currency, not all investors are scared off by the market, and some of the more seasoned and courageous are staying put. “There is an anxiety, but on a long-term basis Russia remains a very attractive market,” Otty told RT. Though Ernst & Young isn’t expecting Russia to grow economically in 2015, it doesn’t believe the gloom will last forever. The company has worked in Russia since 1989, and according to Otty, has seen much worse. Russia’s economy has suffered as a result of geopolitical tensions with the West, which has resulted in sanctions against the country’s biggest sectors- finance and energy, as well as defense. “Political tensions come and go but long-term plans should be implemented,” Christopher Pissarides, a professor of economics at London School of Economics, told RT. Pissarides is also a recipient of the Nobel Prize in economics. Most analysts agree that Russia is more financially prepared to fend off a crisis, as it did in 2008, assisted by its massive currency reserves. In 1998, the state coffers were nearly empty, and Russia defaulted on its debt. “It’s going to be tough in the next few months to cope because Russia can’t suddenly switch off,” Pissarides added. In 2014, the ruble lost more than 45 percent of its value, provoked by plummeting oil prices, which have fallen by more than 50 percent since June. “Despite the currency’s volatility representing a risk for investment, China will invest,” Bing Xiang, the founding dean of Cheung Kong Graduate School of Business (CKGSB), told RT, on the sidelines of the Gaidar forum. 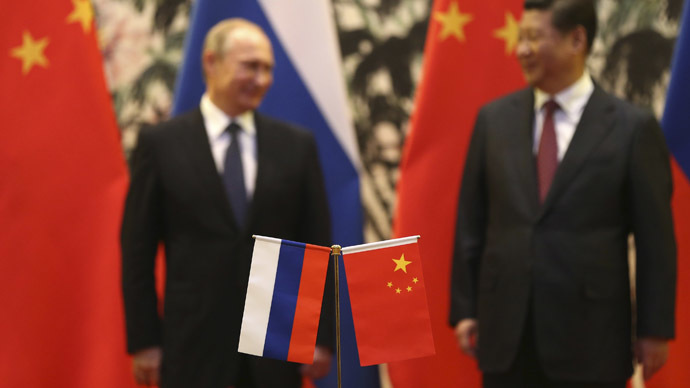 China and Russia have been increasing diplomatic and economic ties amid worsening relations with the West. Resource-rich Russia and the ever-expanding Chinese economy complement each other well, according to Xue Lan, the Cheung Kong Chair Professor and Dean of the School of Public Policy and Management (SPPM) at Tsinghua University in China. “China has been very cooperative with Russia, and a partnership is being in negotiation, both have agreed to increase trade. The growth of the Chinese economy will generate huge benefits to Russia, which in turn, has a lot of natural resources with which it supported China,” Xue said. Xue urged that Chinese investors will take a “long-term” view of the Russian market, also lauding the increased cooperation between BRICS countries.